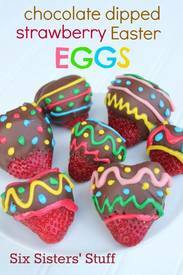 Easter is coming quickly and these cute dipped strawberries will be so fun for your Easter celebration. It’s a fun twist on decorating eggs…you decorate your own strawberry! You can’t mess up these berries, any design or squiggle with the icing looks artistic. Enjoy making this edible holiday project with your family. We know you will enjoy eating them!